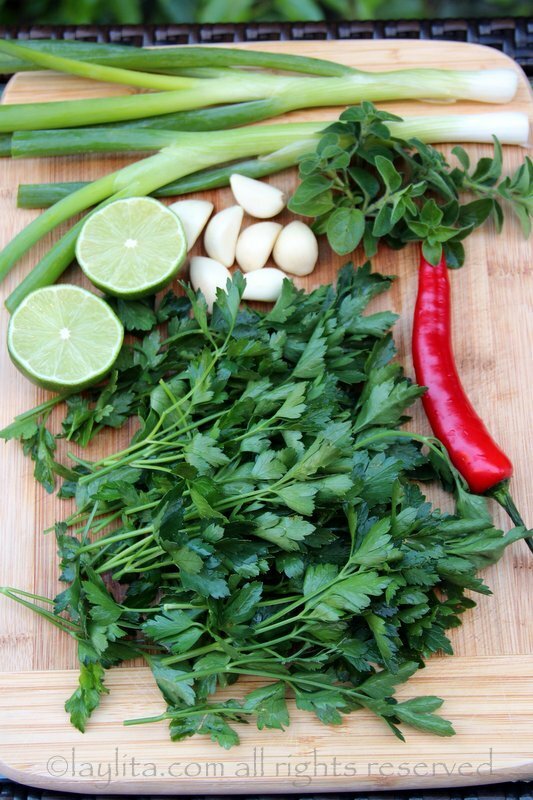 This traditional chimichurri sauce recipe includes parsley, oregano, garlic, onion, red pepper, vinegar and oil. 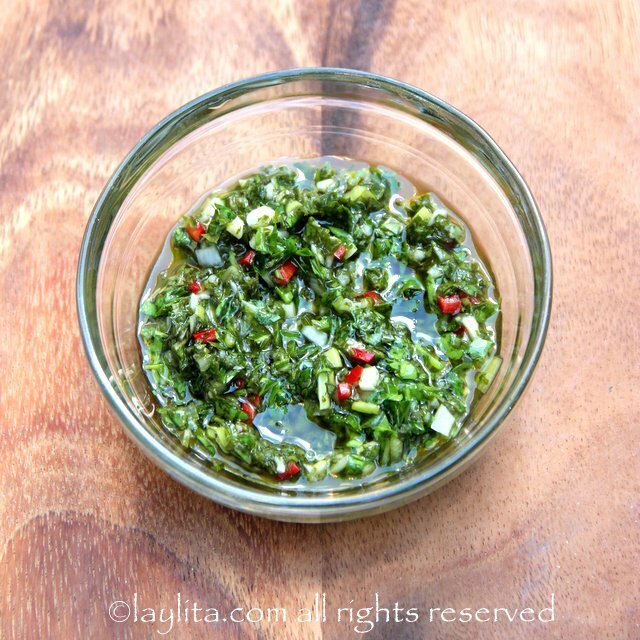 I realized that I haven’t shared my recipe for a classic chimichurri sauce yet. I previously posted a recipe for a quick version that uses fresh basil and also a balsamic chimichurri recipe, which has a higher ratio of oregano. Traditional or authentic Argentinean chimichurri sauce is usually made in a mortar and pestle or by chopping the herbs very finely. Sometimes (like in the quick recipe) you can take a shortcut by chopping the ingredients in the food processor. For this version I prefer to chop the ingredients by hand. Of course, if you need it quickly or don’t have patience (or a sharp knife) then you can obviously use a small food processor. 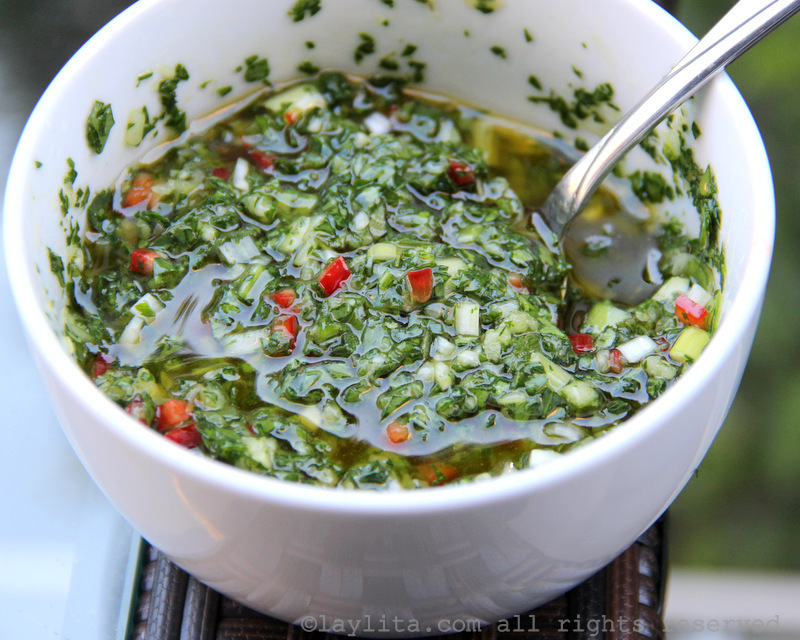 Traditional chimichurri sauce recipe made with parsley, oregano, garlic, onion, red pepper, vinegar and oil. 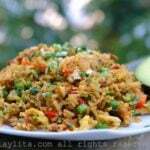 Use to accompany empanadas and grilled meats. Combine all the ingredients together in a medium sized bowl and mix well. 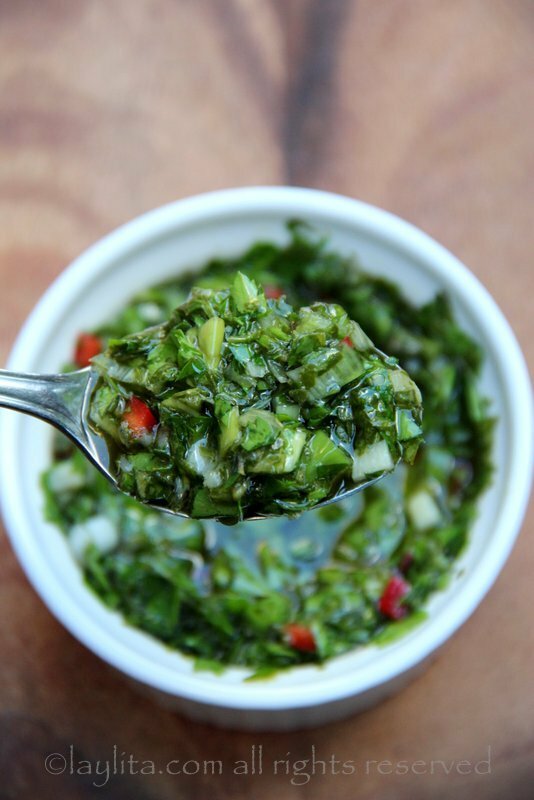 The chimichurri can be made ahead of time, but should be kept refrigerated and is best if used within 24-48 hours. I used fresh oregano and fresh hot pepper in this recipe. You can also use dried oregano and dried red pepper flakes if you don’t have the fresh ones available. During the summer months I recommend trying it with the fresh ingredients. I love fresh oregano and it’s so easy to grow – regardless of if you have a large garden or just a small container herb garden. You can also adjust the amount of red wine vinegar suited to your preference. 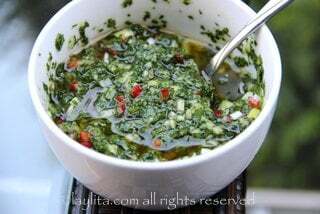 Personally I like just a hint of acidity in a classic chimichurri so I added just a bit of vinegar and lemon juice. 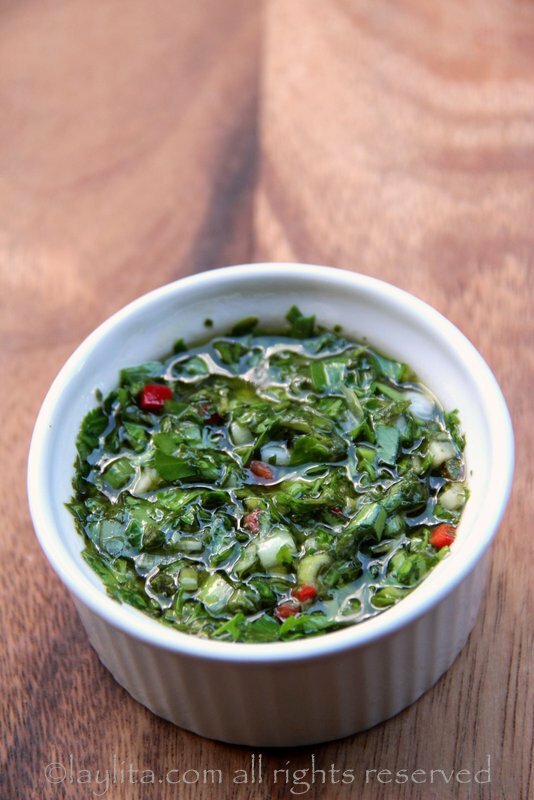 Chimichurri sauce typically accompanies meat and poultry dishes – especially when grilled. 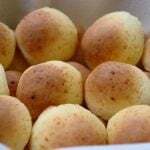 It also makes a great dipping sauce for empanadas and bread; you can also sprinkle it on top of veggies (steamed, roasted or grilled). The sauce makes a great dip and tasty addition to parties, people often come back to eating more. 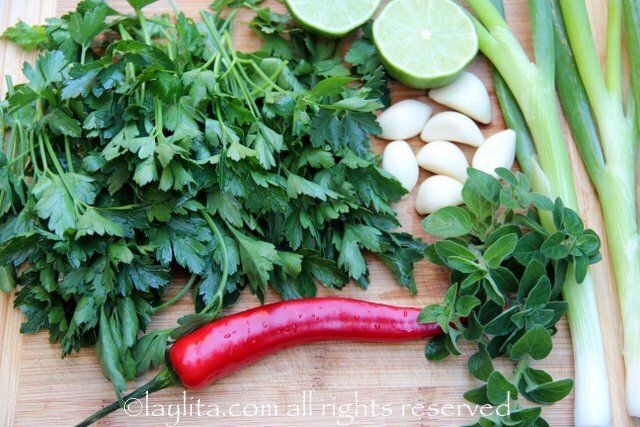 I love to use it as a marinade for chicken/meat. Very good recipe. Found it and have never looked back! I adjust some of the portions a bit since I love garlic and but if you follow these portions exactly it comes out very good. 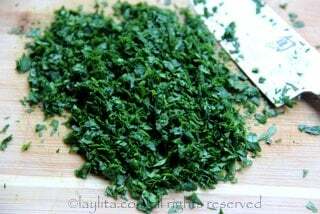 Does take some time to chop everything up and not having a lot of stems and trying to use a food processor as a shortcut is no substitute for hand chopping the parsley. I also occasionally do cilantro as well. 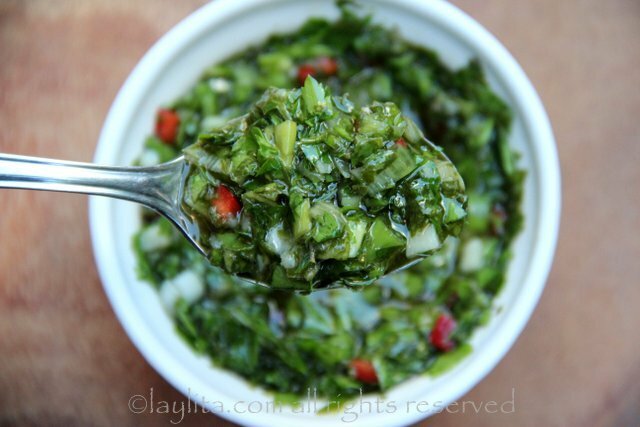 I struggled for years to duplicate the recipe for chimichurri like I had in Uruguay when I was young. It wasn’t until I found your recipe that I was able to do it! The missing ingredient for my palate was the addition of a pinch of cumin. Perfect and my meats are SO happy!